For increased productivity and efficiency with a workforce on the move, the GP640 is a simple radio with the features to get the work done on time. The radio helps to protect vulnerable workers with Emergency Signalling triggered by pressing the bright orange Emergency Button which sends a help signal to a pre-defined person of group of people. The Time-out Timer allows for more efficient use of the radio channels by limiting the amount of time for which a user can transmit. Missed Call Alerts makes returning an unanswered call easy. Dynamic regrouping allows radio talkgroups and preferences to be changed remotely, keeping radios in use in the field. The GP640’s features can be expanded with separately available option boards. The fully compliant MPT signalling package includes MPT1343, Regionet 43 and ANN modes of operation. 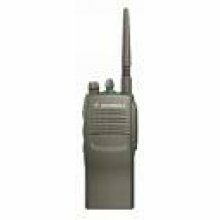 Radios are configurable for up to 2 personalities including Talkgroup Select and Conventional signalling. Crisp, clear and strong audio quality in virtually any noisy environment. Low level expansion allows further improvements in audio quality by reducing noise usually heard during pauses in conversation. Provides over-the-air reconfiguration of the radio. The radio can store an incoming caller identity and prompt the user to return the call they receive. You can expand the capabilities of GP640 by adding option boards such as Voice Storage. Provides flexibility in deployment and stocking. Limits the amount of time a user has to continuously transmit on a channel. This allows for more efficient use of the channel.